Iron deficiency is the most common nutritional deficiency in the world and means there is insufficient oxygen in the blood to be transported to the cells and results in weakness, fatigue and poor immunity among other symptoms. A chronic deficiency causes anaemia. There are two types of iron, haem and non-haem. Haem iron is found in animals products and does have a higher level of bioavailability (is more easily absorbed) than non-haem iron which is found in plant foods. 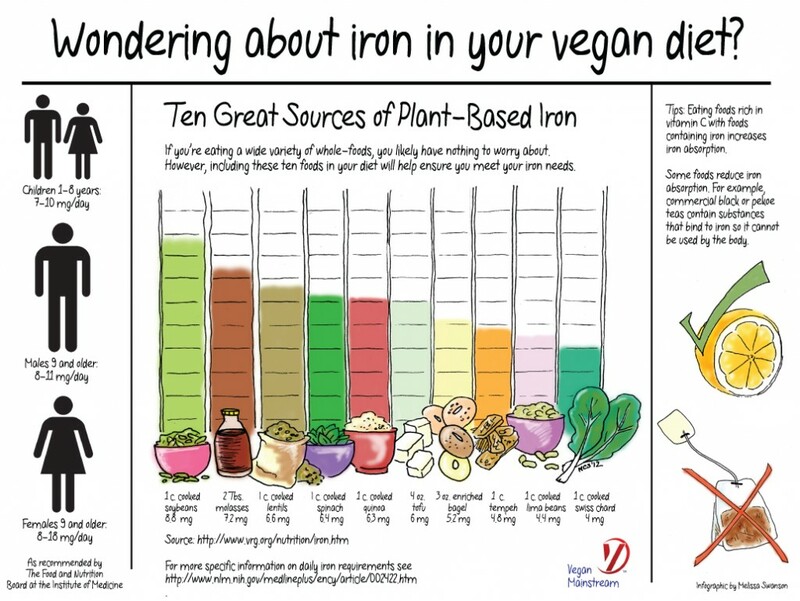 However in no way does that mean a vegan or vegetarian diet is deficient in iron. In fact, studies in the UK and Australia have shown most people, whether they eat animal products or not, get most of their iron from plant sources – around 80%. Absorption rates or non-haem iron can be influenced by a number of factors. The main factor influencing absorption (where no medical problem exists) or any type of iron is the iron level of the individual. The lower your iron levels the higher your rate of absorption. The body tends not to store more than the required amount of iron, so the excess is eliminated. There are also dietary factors that can either enhance or inhibit iron absorption. Vitamin C and Vitamin A enhance the absorption of non-haem iron. While phytate (found in legumes, nuts, wholegrain cereals and unprocessed bran – but can be reduced by soaking and sprouting) and poly-phenyl containing drinks (tea, including herbal, coffee, cocoa and red wine) inhibit the absorption of iron. Of course, if you consume both enhancers and inhibitors they tend to cancel each other out. Iron and vegetarian diets by Angela V Saunders, Winston J Craig, Surinder K Baines and Jennifer S Posen, The Medical Journal of Australia 2012. The recommended daily intake (RDI) of iron varies from country to country as well as age and gender. For example in the UK the RDI for men aged between 19 – 70 is 8.7mg and for women aged 19 – 50 is 14.8mg, with the upper limit at around 45mg (upper limits are set for nutrients that can cause health problems if too much is consumed). Currently in Australia, the RDI of iron for vegetarians is 80% higher than for people who eat meat. This is a highly questionable decision, and in my opinion, can be safely ignored, since it was based on a single study using a diet specifically designed to inhibit the absorption of non-haem iron. Iron is found in an abundance of plant foods. These include beans, legumes, grains, nuts, seeds, dark leafy greens and dried fruits. In the case of grains, the iron is found in the outer husk, so while brown rice is high in iron, white rice is not and while wholemeal or wholegrain bread is high in iron, white bread is not. In many countries cereals and flours are also fortified with iron. If you live in a country where food is abundant and have a varied diet that included the foods mentioned above, then any deficiency is more likely the result of a problem with absorption. Do you have a problem with iron levels? Nice Post! I am wondering if you can get iron from cooking with an iron skillet. I heard this is true, have you heard this too? I’ve heard that too, though I don’t know if it’s true. I found this study (http://www.ncbi.nlm.nih.gov/pubmed/3722654) which seems to indicate that it is true, but it probably varies a lot depending on the type of food you’re cooking and the iron content and age of the utensil.